The Tesla (NASDAQ:TSLA) roller coaster ride continues. As Model 3 production ramps higher, many wonder whether it can continue be profitable selling a $35,000 Model 3. Meanwhile, TSLA stock plunged on news of a layoff that served more as a profit warning. To be sure, this announcement reinforces the risks associated with Palo Alto, California-based TSLA. 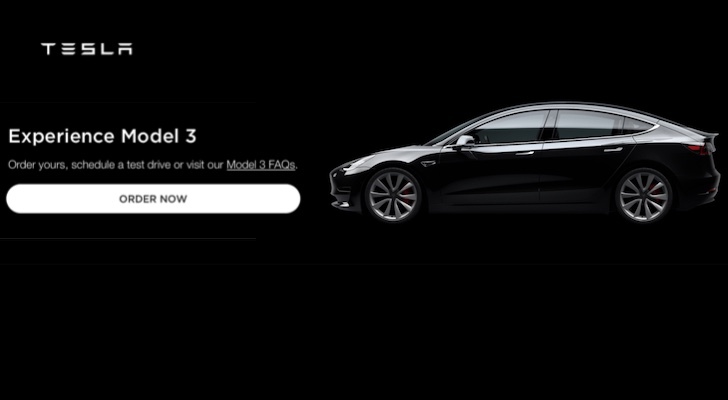 Despite its large size and popularity, it still has to prove it can succeed with the Model 3. However, amid the dangers, I think risk-tolerant investors should see the lower stock price as an opportunity. Without a doubt, recent events have reminded the investing public of the volatile nature of Tesla stock. News that the electric car maker will cut 7% of its workforce sent TSLA stock down by more than $45 per share, a loss of almost 13% in one day. However, instead of celebrating cost reductions, the market read the announcement as a profit warning and sold off Tesla shares. I cannot stress enough that risk-averse investors should avoid Tesla stock. Even after the Jan. 18 share price drop, TSLA turned profitable only recently and still trades at about 55 times forward earnings. This is in an industry where even the better-established automakers such as General Motors (NYSE:GM) and the firm now known as Fiat Chrysler (NYSE:FCAU) have gone into bankruptcy. Also, while CEO Elon Musk has become a renowned inventive genius, he remains a controversial leader. Late-night tweets and other issues in recent months have not helped to build investor confidence in either his genius or leadership skills. Moreover, if Tesla’s earnings fall, or if the profit margins disappear, any buy case for TSLA stock falls apart. Under the current conditions, one needs a cast-iron stomach to ride out TSLA. Despite this, I now see a buy case for Tesla stock, at least for risk-tolerant investors. A week ago, I would have said, “buy on a pullback”; With Friday’s retreat, that chance has arrived. The forward price-to-earnings (PE) of 55 might still appear high. Still, investors should also note that the recent news is a profit warning, not a collapse. Reducing costs with a layoff should help those profits. Despite this news, analysts still forecast profit growth in the triple digits through at least 2021. I’ve previously written about TSLA stock’s “vision premium.” I think this premium goes beyond Tesla’s popular electric cars. Although most revenue comes from selling autos, the battery serves as the product that truly unifies Tesla. The battery not only powers cars, but it stores energy collected by its solar cells. The press covers the energy division less often. However, it also registered double-digit revenue growth in the last quarter. If products such as the Tesla Solar Roof become more widely adopted, it will dramatically alter the way the world powers homes. Given these factors and the level of earnings growth, I see the 55 forward PE as a modest vision premium. Investors should look at the recent nose-dive in TSLA stock as a buying opportunity instead of a reason for concern. Naturally, the layoffs and profit warning that the company announced alarmed some investors. Between the CEO’s odd behavior and Tesla’s short history as a profitable company, believing in TSLA still requires courage. However, I see reasons for optimism for those that can handle some risk. For one, having a smaller workforce makes further profitability more likely. More importantly, Tesla’s cars and solar panels hold promise to improved lives with a smaller impact on the planet. Put simply, TSLA stock allows investors to buy the future. Given the changes in tech and the massive profit growth coming, a 55x forward PE is a low vision premium to buy into this tech revolution. Article printed from InvestorPlace Media, https://investorplace.com/2019/01/tesla-stock-profit-drive-bumpy-road/.